Front-End System covers the scope of staff/cashier, waiter/waitress, and time attendance like mobile ordering system, Kitchen Display System, cash management, etc. Web-Based Back Office System provides its features to support owner and staff in terms of multi brands, multi prices, variety of promotions, etc. Inventory System supports SCM giving the mutual benefits to owner, staff, suppliers, and distributors. 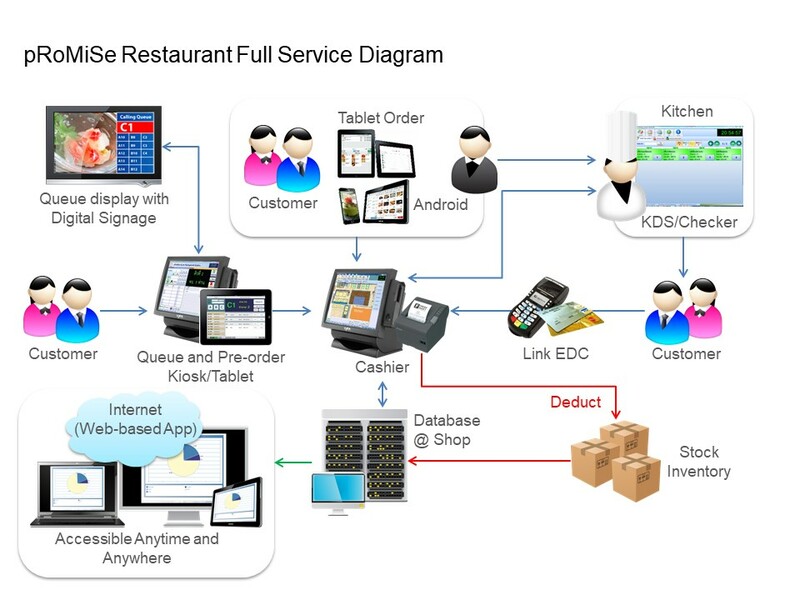 ● Android Ordering System : pRoMiSe supports mobile ordering system like Android device to improve service efficiency. ● pRoMiSe Multi-touch Kiosk Ordering System : pRoMiSe system offers the most advance technology of ordering system. With our multi touch Kiosk system, customers can even place their own orders. ● pRoMiSe Queuing and Pre-Ordering System : pRoMiSe queuing system links to pRoMiSe ordering system allowing customers to pre-order their meal. Also, the queuing system can link to digital signage system to show the advertising message and queue status at the same time. ● pRoMiSe KDS : pRoMiSe Kitchen Display System helps speed up the delivery time. Comprehensive reports allow the management team to track service time per menu item during peak periods in order to improve the service level. ● pRoMiSe EDC Link System : pRoMiSe can integrate with leading EDC terminals from Hypercom, Nera, and Posnet to shorten payment process time and reduce human errors. ● pRoMiSe Electronic Journal : pRoMiSe support EJ standard (Electronic Journal) so that merchants can apply paperless system for their transactions. ● Support Variety Types of Menu & Sale-mode : pRoMiSe system allows to create different types of menu and sale-mode such as selectable menu set, combo set, menu size, take away, and delivery. ● ERP Interface : pRoMiSe system allows to interface with the ERP system. We do interface with SAP, Microsoft Dynamics AX, and MAC5. Customization with other ERP systems is available based on customer needs. ● Multi-angle Reports : Provide easy-to-read informative and analytical reports, such as sale, cost, and customer spending. ● Promotional Tools : Enable comprehensive tools to perform many kinds of sale promotions, such as specific period price discount, selective member discount, coupon, and voucher. ● Inventory Management : Perform every needed aspect about inventory management for restaurant. ● Membership Management : Superior with dynamic self-creatable kind of data collecting for further analysis on me mber’s behaviors. ● Multi-branches Management : Support networked branch, and franchise system with centralized information control.